They started to explode on the shrub/tree I planted years ago. 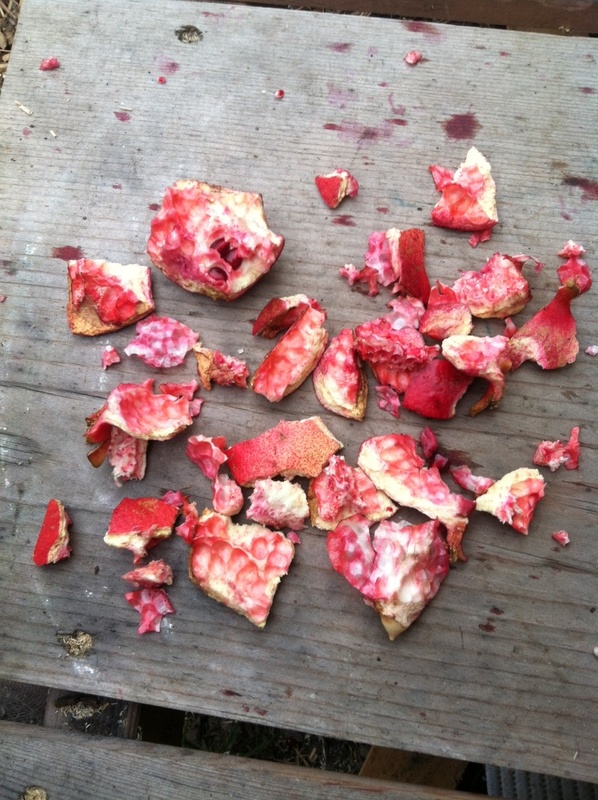 My first good crop of Wonderful Pomegranates. I had thought: they’ll never ripen here. I thought they needed heat. Dry heat. Which we don’t have much of here in Oakland. But ripen they did. We ate them raw. Frannie is allowed to eat them outside only because they are so messy and juicy. 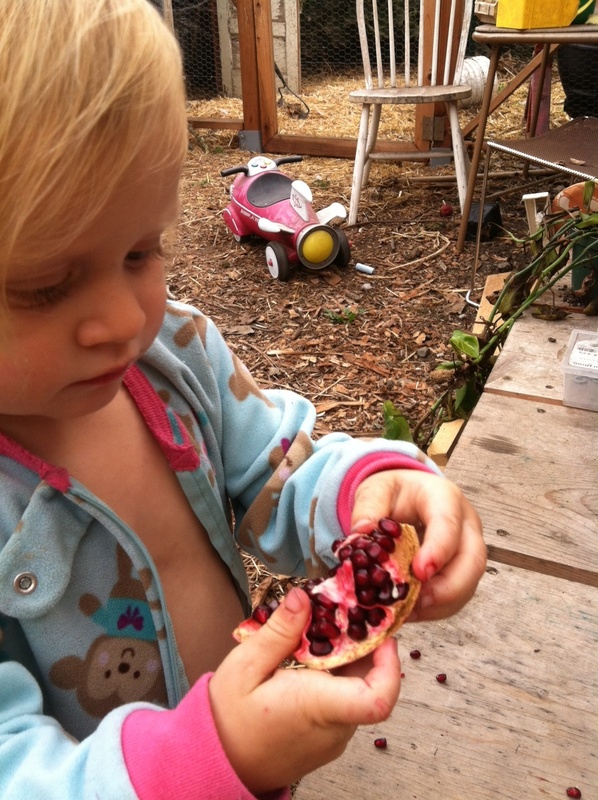 They are one of her favorite snacks, partially because of the work they involve, digging the seeds out, pulling off the pith and membranes; partially because (I think) of that incredible crunch, the explosion of fresh juice in the mouth. Until now, there’s nothing left. Besides snacking on them, I sometimes threw them into salads, like massaged kale salad, to add a bright sweetness. Some people recommend cooking with poms, like Ken Albala. I had never heard of Ken before, but I found myself in Idaho of all places, at the Bookpeople in Moscow, Idaho, and the owner highly highly recommended his book, The Lost Art of Real Cooking, and its companion, The Lost Arts of Hearth and Home. The books are instruction manuals for how to make all sorts of crazy stuff like a koji rice mold and rag rugs; and stuff that you wished you made but haven’t yet like corn tortillas (nixtamalizing your own corn, of course), olla podrida (look it up! ), and marmalade. I’ve never met Ken or his co-author, Rosanna Nafziger, but they are totally my people! Ken lives in Stockton where he teaches food history at the University of the Pacific. I think he must have some pomegranates growing in his garden because in the Hearth and Home book, there’s a recipe for pomegranate molasses that sounds out of this world. Basically you just cook the pomegranate seeds with some sugar and vanilla for a million hours on low. The result is that gummy blood-like sludge that tastes like heaven. Sadly, Frannie and I ate all the poms fresh. 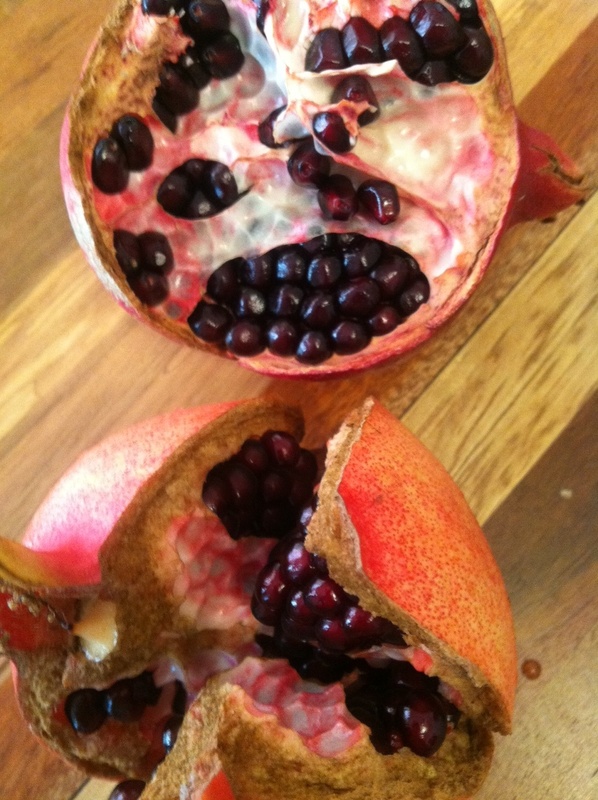 Next year I’m hoping the pomegranate tree will have biggered itself and I’ll have enough to try the recipe…But if you find yourself with an overabundance, give it a shot. Any other good pom recipes out there? The garden is not going to sleep, though it really should. Like a wily toddler, it’s trying to convince me to just stay up just a little longer. It does that by continuing to produce tomatoes. To ripen a few more figs. The pumpkin plants were even making new flowers. But there is a moment when you have to be mean, and just pull everything up, force the garden to focus on the rooted things like leeks and garlic; and greens planted long ago like kale and broccoli and salad mixes. The bees are even in the game, out in huge numbers during these sunny days. I’m betting December will be the month when the garden quits needling, gets sleepy, and finally falls asleep. Here’s a photo from the last farmstand–thanks to everyone who came! Urban agriculture tends to take hold first in places that can be defined as apocalyptic. 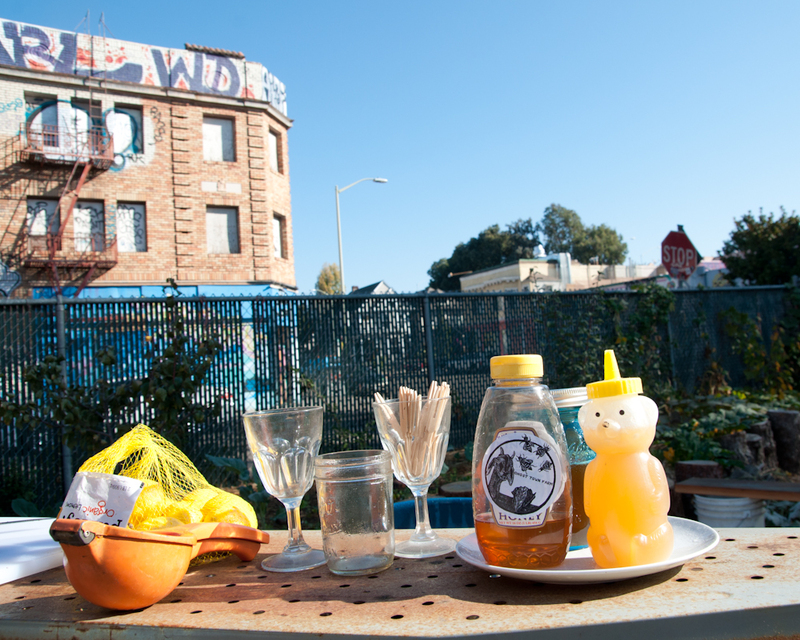 These damaged zones, in cities like Oakland or Detroit, have suffered from years of poverty and neglect, and are now hosting some of the most vibrant–and urgent–urban farms. This class will begin with an examination of how agriculture came about in the first place and how industrial agriculture (creating an apocalyptic landscape of its own) came to dominate our food system. The class will then delve into the revival of small scale farms and urban farms, questioning what forces came to pass that allowed this turning point to occur. We will take field trips to urban farms and meet guest speakers who work on the ground. Students will create a food experiment loosely based around an apocalyptic or catastrophic event. We will also write personal essays based around a turning point in our lives where everything changed, when an old self was destroyed, allowing a new self to germinate. We will probably read Rebecca Solnit’s Paradise Built in Hell; excerpts of Octavia Butler’s The Seed Sower. Not The Road. Let me know if any of you have suggestions for other great apocalyptic literature. I’ve actually been thinking it might make sense for me to teach this class at my farmlette in the Fall. Let me know if there are any interested students!